Pennsylvania Art: From Its Beginnings to the Late Nineteenth Century. Selected Works of Horace Pippin. George Washington Crossing the Delaware, by Emanuel Leutze, 1851. "The romantic ruins of what were once free cities. . . led me to think how glorious had been the course of freedom from those small isolated manifestations of the love of liberty to where it has unfolded all its splendor in the institutions of our own country. Nearly crushed and totally driven from the old world it could be vanquished, and found a new world for its home. This course represented itself in pictures to my mind, forming a long cycle, from the first dawning of free institutions in the Middle Ages, to the reformation and revolution in England … to the Revolution and Declaration of Independence." Leutze's vision is a good starting point for thinking about art and history in Pennsylvania. 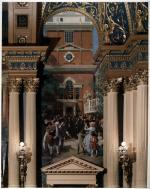 Several of the most famous images of United States history were painted in Pennsylvania, by Pennsylvanians, or about Pennsylvania: Connecticut's John Trumbull executed the famous "Signing of the Declaration of Independence"; Benjamin West, although originally a Pennsylvanian, lived the last fifty-seven years of his life in England where he painted "William Penn's Treaty with the Indians." Peter Frederick Rothermel's "The Battle of Gettysburg: Pickett's Charge" fits all three categories. These works also share a lesser-known feature with Leutze's: they do not accurately portray history. Washington was by no means as sure of his victory the following day at Trenton as he appears to be; had he stood up as the boat navigated the ice-caked river it probably would have toppled over. Rothermel's gigantic work, painted between 1867 and 1870, commissioned by the Commonwealth of Pennsylvania, provoked arguments over who was where at the moment that George Pickett's Confederates reached the Union lines, and over why he singled out some individuals for inclusion while omitting others. But at least Washington did cross the Delaware, and Union troops did repulse Pickett's charge. The Declaration of Independence was never "signed" in the dramatic ceremony depicted by Trumbull: it lay on the table in front of Congress for much of July and August, 1776, with members affixing their signatures from time to time. And William Penn never made "a treaty" with "the Indians"; in 1682 and 1683 he negotiated a number of separate purchases with the various independent groups who lived near Philadelphia. 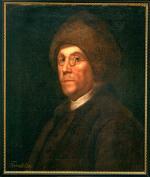 West's painting, executed in 1771, was requested by Penn's sons Thomas and Richard when Pennsylvanians, led by Benjamin Franklin, were lobbying with the British government to end the Penn family proprietorship. The brothers wanted people to remember how "the Holy Experiment" started by their father had kept the peace for seventy-five years. Whether the painting helped or not is mere speculation, but the brothers did keep their lands in the brief period remaining before the American Revolution. So are these paintings "bad" art or "bad" history? Like a good book, they do not bore us with details. Even if Penn made several treaties rather than one, or if the signers of the Declaration wrote their names over time rather than on the same day, what really matters is that West and Trumbull bring home the significance of pivotal historical moments in a way that a literal retelling of every step of the process could never do. Rothermel places us in the fray of battle; Leutze conveys Washington's never-say-die spirit. All history is a summary, with more left out than put in. What matters is that the meaning and importance of the event, or person, or story is not lost, or trivialized, or used to bore rather than excite the reader or viewer. Good art, like good history, makes us believe that its subject is important, and that our relationship to both it and the artist's vision ought to matter. Washington Marching through Philadelphia, Violet Oakley, circa 1906. Let's consider some alternative depictions of significant historical events. In the Pennsylvania State Capitol is a mural by Violet Oakley, entitled "Washington Entering Philadelphia." Here, the general is as proud as he is in Leutze's boat, but behind him are questioning, if not hostile faces of people who only know that their Revolution has led to suffering and sacrifice, and who are justifiably unsure of its outcome. Also in the Capitol is Edwin Austin Abbey's "Reading of the Declaration of Independence." Here, Abbey depicted most members of the crowd with happy faces, but we can also see a man with a sword barring a woman (who is not "created equal") from participating, and a skeptical figure off to the side who reminds us that nearly as many Americans fought for George III as for George Washington. Contrast Trumbull's signing with Robert Edge Pine's "The Congress Voting Independence", a painting completed by Edward Savage in 1790. This far more informal picture of delegates holding separate conversations and looking in different directions suggests a much-debated work in progress rather than a perfected, finished document. Compare the map of the several land purchases that Penn made to secure occupation of what is now metropolitan Philadelphia - a map that indicates the great effort Penn made to obtain fair title to the land - to West's image of a simple, single treaty. Imagine the different feelings evoked by Civil War photographers of the battlefield dead at Gettysburg to those evoked by Rothermel's heroic canvases. Photography may not always be "accurate" either. Civil War cameramen arranged bodies on the battlefield to emphasize the horrors of war, and at times indiscriminately grouped Union and Confederate dead whom they then mislabeled. A painting or a photograph, like history, is produced by one or more individuals at a particular time for a particular purpose. That Trumbull went to extraordinary lengths to paint the face of every signer of the Declaration as accurately as he could some forty years after the event - even as he placed them in a fictional event - tells us as much about the painter and his audience as it does about the founding of the United States. Art, as Leutze noted, is a way of remembering history. But it is a selective remembering, and what is remembered, and what is not, is a story as interesting as history itself, and a part of that history. Let's take another example. Who does not know the famous portrait of Benjamin Franklin, wearing a fur cap, in contrast to the bewigged aristocrats at the French court where he negotiated the alliance that won the Revolution? Some historians have claimed he wore the cap to hide a scalp condition, but a wig or more elegant headpiece could have done that just as well. Franklin knew the French had a vision of America as the home of unspoiled, virtuous people who were in touch with nature, and he made sure he fit that image to a "T."
In the paintings Franklin sat for in the decades before he left Pennsylvania, he made sure he was wearing a fine wig and elegant coat to show everyone that here was the poor printer who made good. In England, too, where as a colonial agent he had insisted that the colonies were mature societies who had outgrown the parent-child relationship with their mother country, his portraits represented him as a man of science and as an intellectual, dressed to the nines to embody the cause for which he spoke. Is the real Franklin the folksy "Ben" or the eminent "Dr. Franklin?" Neither? Both? All we can say is that we tell stories about Franklin, just as he told stories about himself by having his portrait painted in different guises, for different purposes. To understand a work of art, we need to understand the story behind the story, and explain who brought it into being, for what reasons, and with what consequences. For three centuries, Pennsylvania stood at the forefront not just of America, but of world history. In the seventeenth century, Pennsylvania successfully put into practice the unprecedented notion that people who believed in different religions could live in peace with each other and even with the original inhabitants of the colony they occupied. In the eighteenth century, the two most important documents that gave birth to the world's first modern republic, the Declaration of Independence and the United States Constitution, were framed in Pennsylvania. In the 1800s, Pennsylvania was the leading industrial state in the world's leading industrial nation, where more coal, iron, steel, and oil were produced than anywhere else on earth. In the twentieth century, especially its later half, Pennsylvania has been one of the United States' major symbols of economic decline and de-industrialization, symbolized by decaying steel mills and coal towns, and the underground mine fire at Centralia that will not be extinguished for centuries. But it is also the site of much natural and man-made beauty where old towns and houses recall the eighteenth and nineteenth centuries amid valleys that boast some of the world's most productive farmland and mountains whose second-growth forests have begun to approximate the grandeur of the original "Penn's Woods." Pennsylvania art has also reflected this history. Much of it has celebrated the Commonwealth's and the nation's religious and political ideals, its beauty and economic wealth, and progress. Yet it has also mourned injustice, criticized intolerance, called attention to the environmental and personal costs of industrial growth, and sought solace in depictions of private life or a nostalgic search for the supposedly better times of the past. Much of Pennsylvania's history and what that history has meant to artists who represent Pennsylvania can be understood through the stories of the state's historical markers.